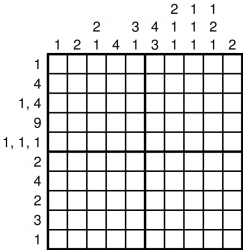 A Hanjie puzzle - also known as a Griddler, Nonogram, Pic-a-Pix or Paint by Numbers amongst others - is an elegant and rewarding Japanese logic puzzle, whereby correctly solving the Hanjie will reveal a hidden work of art. 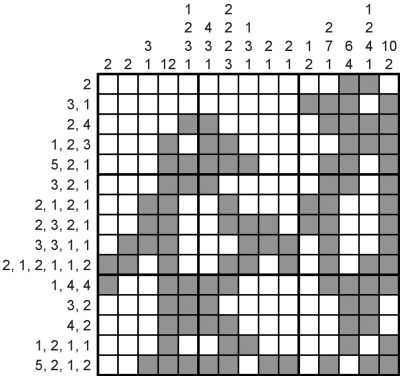 Each puzzle consists of a rectangular grid with one or more clues for each row and column of the puzzle. These are usually given at the left and top of the puzzle respectively. 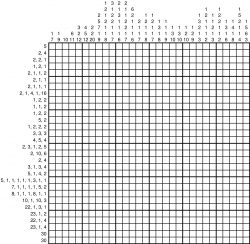 Each set of clues gives you information about the number of shaded squares that are in that row or column. These sets of clues are all that you need to solve the entire puzzle. A row or column with only a single number clue, such as for example "4", means that there are (in this example) 4 consecutive shaded squares and that the rest of the row/column is empty. 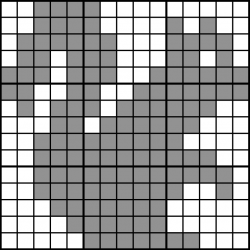 If there are multiple numbers, such as "2 3 1", then this tells you about multiple sets of consecutive shaded squares. "2 3 1" would mean for example that there are 2 consecutive shaded squares, a gap of one or more empty squares, 3 consecutive shaded squares, a gap of one or more empty squares, and then 1 shaded square. In other words, the order of the numbers tells you the order that the different groups of consecutive shaded squares are found in. There is only ever one possible solution, which can always be reached via reasonable logical deduction. Guessing is never required. It's not necessary to use the picture to help you solve the puzzle, although it can certainly give you a good hint that you might have made a mistake if it doesn't seem to be coming out correctly! We can supply Hanjie puzzles at a range of sizes and difficulties, and with any type of art or picture as the result of solving the puzzle. All of our puzzles are entirely hand-made but are checked by computer to ensure there are no mistakes.